Please join us for Silicon Valley Studios this Saturday and Sunday, May 5th-6th from 11:00am - 4:00pm. We have 14 artists at 275B Linden Street in Redwood City - Site 30 in the SVOS guidebook. We are directly behind the Sleep Train on El Camino Real across from Target. 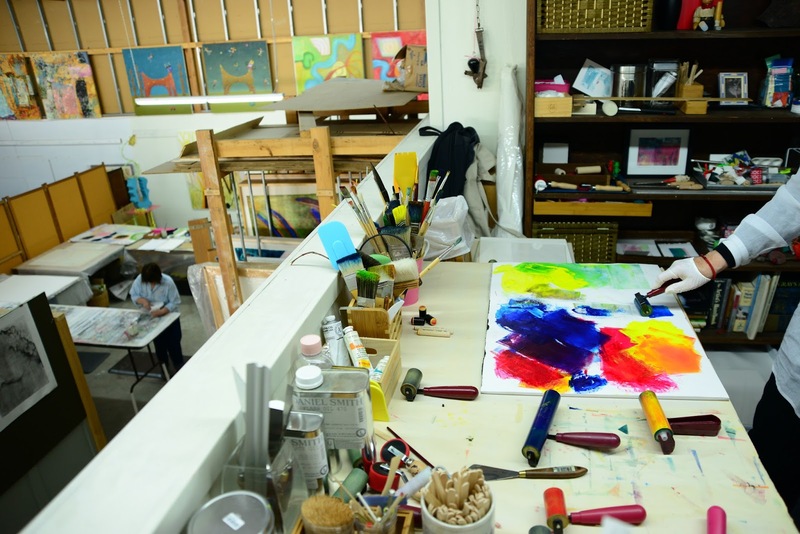 Visitors will be able to learn firsthand from the artists how their work is created. 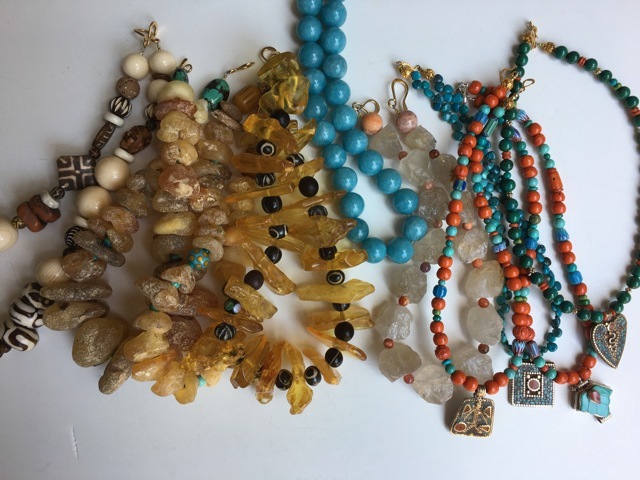 Visitors will also have an opportunity to choose from a wide selection of fine pieces should they wish to buy, including paintings, prints and jewelry. Light refreshments will be served. We look forward to seeing you. Kalani cannot contain her excitement at Pia Brandt and Ed Bellinger's show at The Main Gallery in Redwood City. 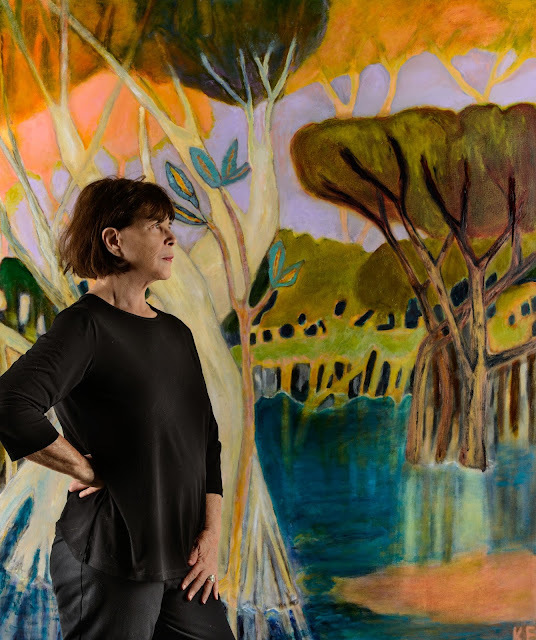 Kalani Engles at her North Carolina studio with the original and two new Salt Marsh paintings. • discover unique items for family, friends and yourself! An artist's brayers. Kalani Engles in her studio below. 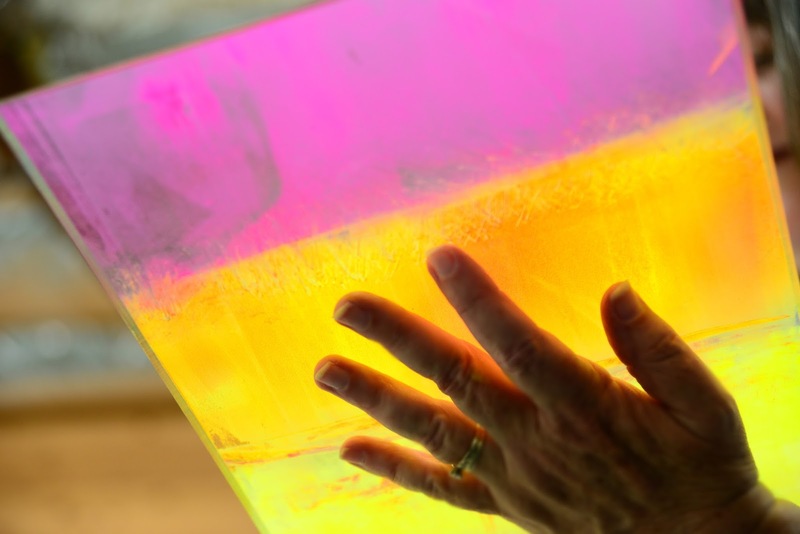 Plexiglass prepared for printing. So lovely as it is. Photos by Erin Ashford. Kalani Engles in her studio painting a steel sculpture for her one person show at the Peninsula Museum of Art. 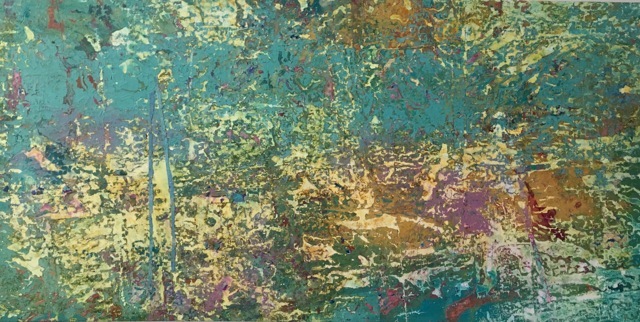 Kalani Engles’ Los Angeles gallery is displaying works of selected artists at the Four Seasons Hotel in Westlake Village from November 2012 through January 2013. The announcement for the show is below. 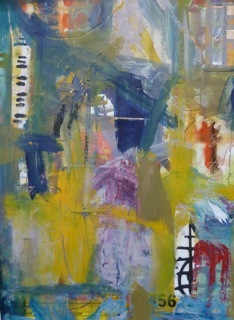 The gallery has selected Kalani’s oil on canvas, Perfume River 4 as her entry for this show. 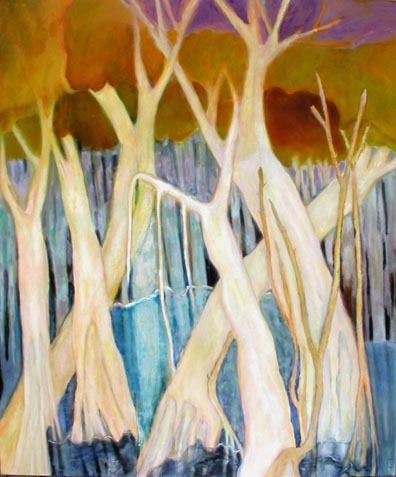 Perfume River 4, oil on canvas, 56 x 66"
George Billis Gallery is pleased to announce a collaboration with the Four Seasons Hotel in Westlake Village, CA. 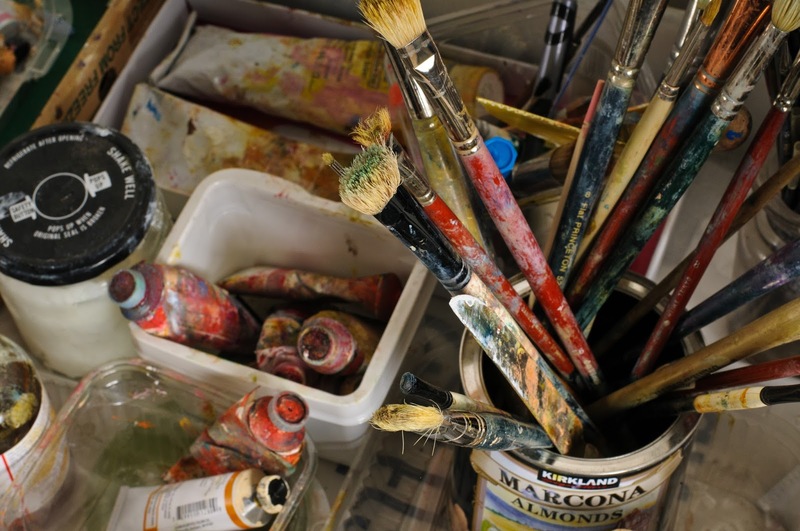 The gallery will be curating a series of group exhibitions in the hotel's mezzanine gallery space. 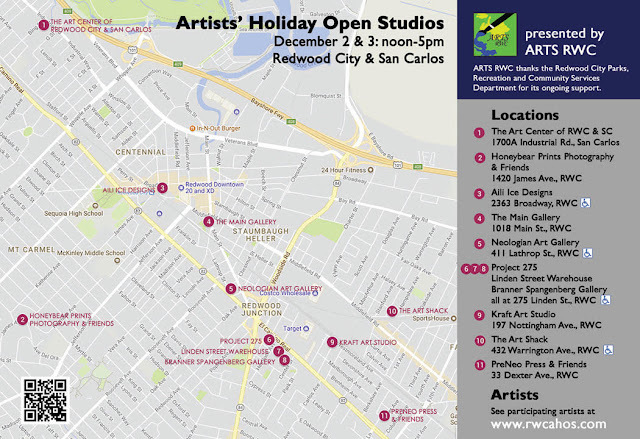 We will be holding a reception on Thursday, November 1st, 2012 from 5-8pm. Poetry, language, and handwriting have become the subjects of my most recent series, covering the last few years. Therefore, I was especially excited to be invited to show 23 of these paintings at the Harvey & Phillis Koch Art Gallery and Cultural Hall at the Jewish Community Center in Palo Alto from August 1 - September 7. 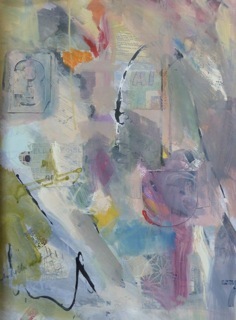 My art has been chosen specifically at this time for the "Litquake" which takes place on August 26 at the JCC. 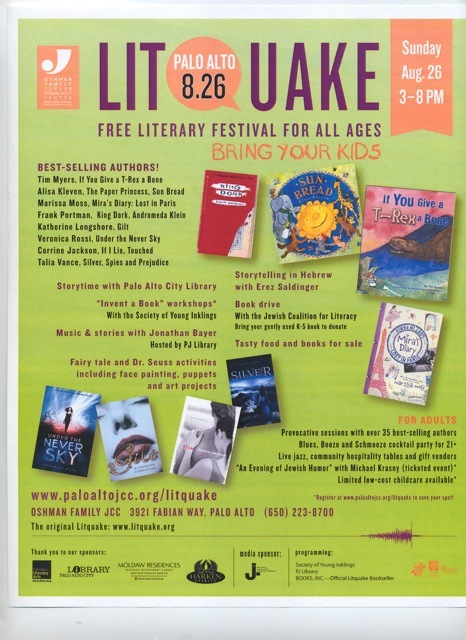 Litquake has taken place in San Francisco in previous years, and the Palo Alto JCC is a new venue for this day of celebrating literature and writing with activities for the whole family. There will be free panels with published authors during the day and Michael Krasney will be the guest speaker in the evening. 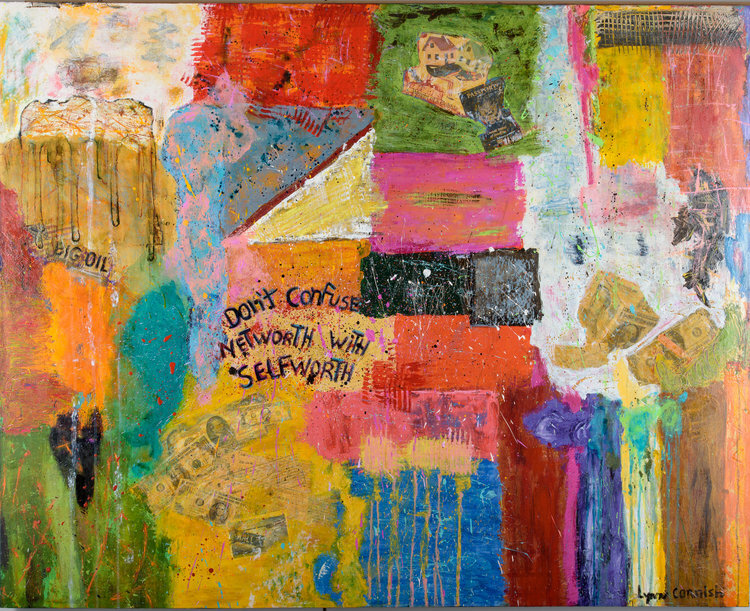 The Gallery Annex at 2115 Broadway (next to The Old Spaghetti Factory) is showing the work of eight artists from Linden Street Warehouse through June 28th. 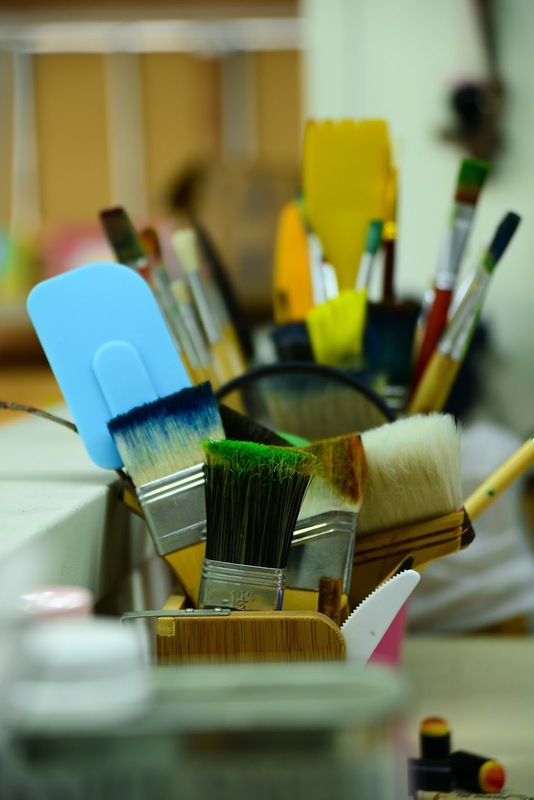 The exhibit features works by the following artists: Mary Alice Bowie, Laura Diamondstone, Kalani Engles, Kris Idarius, Bonny Novesky, Joyce Savre, and Kat Thomas. All works are displayed in the windows, so stroll by and enjoy the Contemporary Artworks! 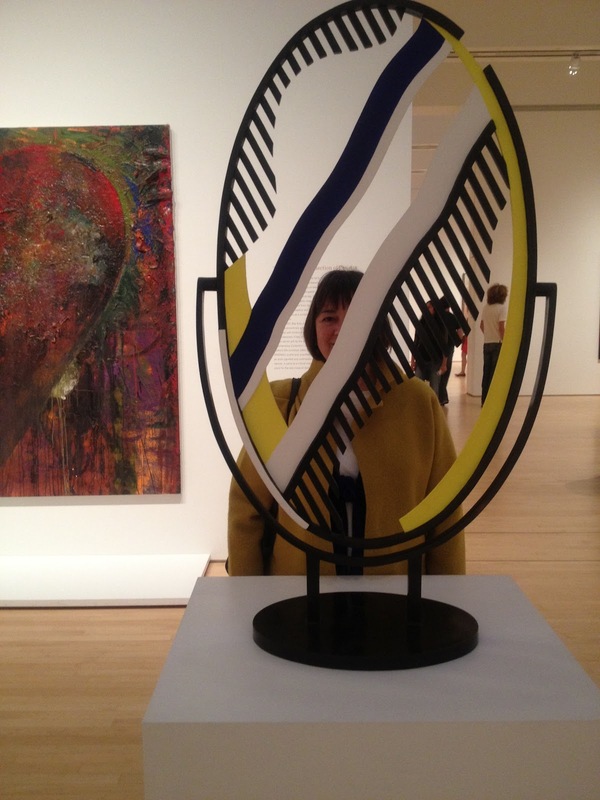 Kalani Engles in front of Savage Garden II - Sold! 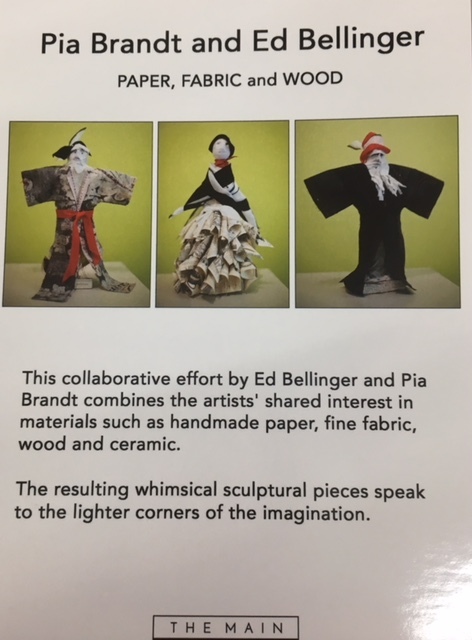 Kalani Engles currently has a show along with artists Jung Han Kim and Melinda Cootsona at The Studio Shop in Burlingame, California. The above photos are from the opening reception on May 24th. 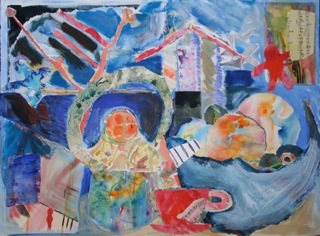 The show runs until June 16, 2012. Kalani's work is from a series called Savage Garden. 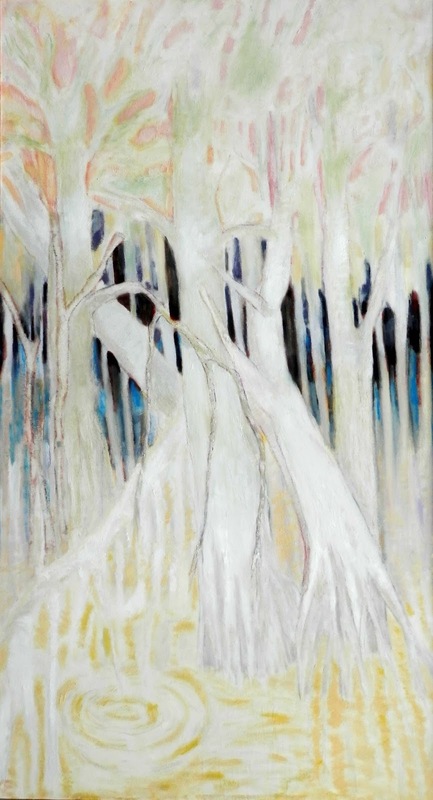 Savage Garden represents a fusion of her two predominant painting styles - abstraction and impressionism. 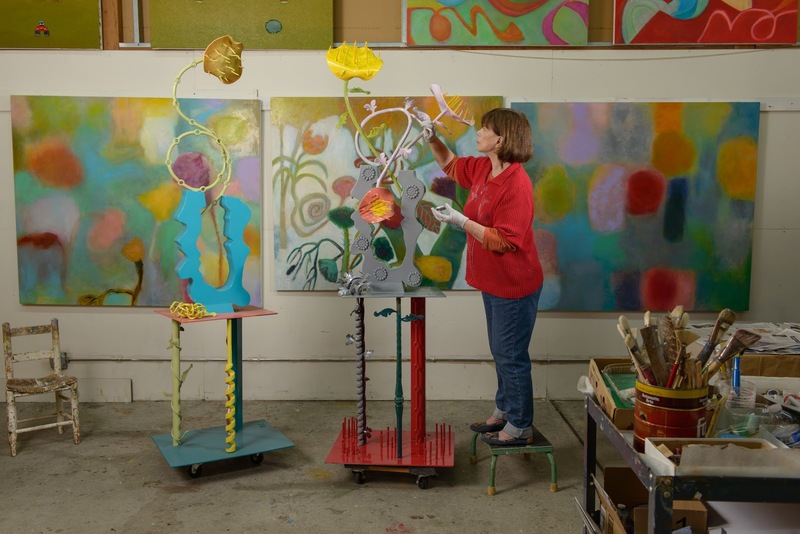 The individual flowers and vines are impressionistic renderings of plants she has seen along the trails near her home. The abstraction in these paintings results from the arrangement of the figures on the canvas. 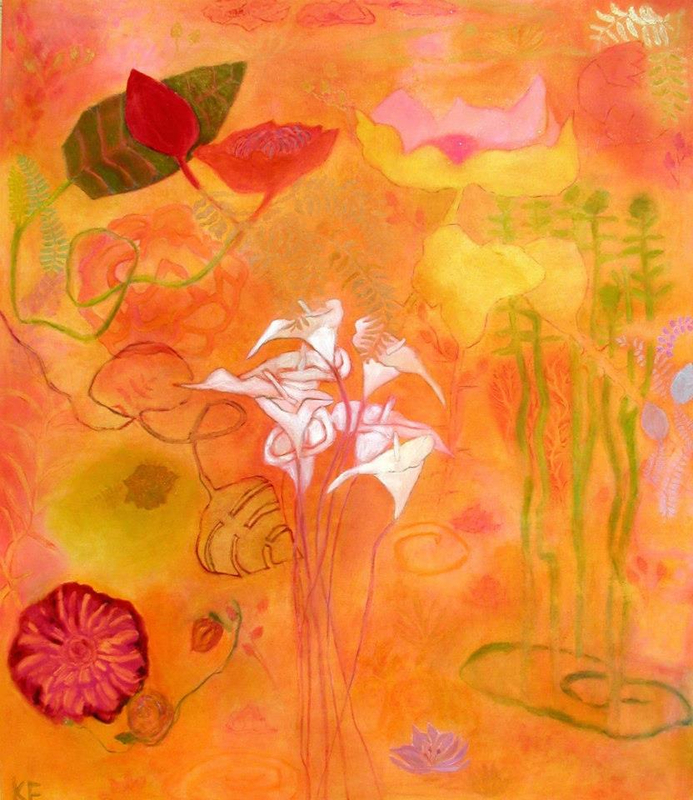 Kalani would like the viewer to experience the essence of a wild garden unencumbered by physical context. 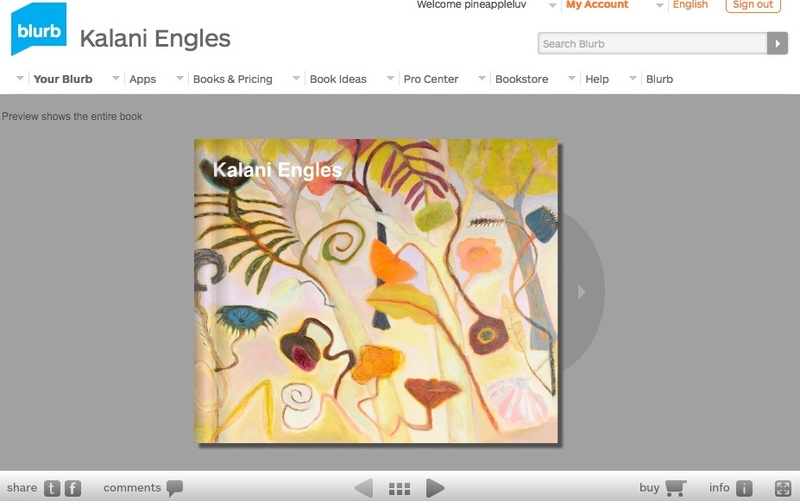 Kalani put together a beautiful book of her work from Savage Garden, which you are able to preview and purchase. Photos by Jay Watson and book editing by Jamie Watson. Joyce Savre is one of three artists chosen to show their work at the Caldwell Gallery in Redwood City. 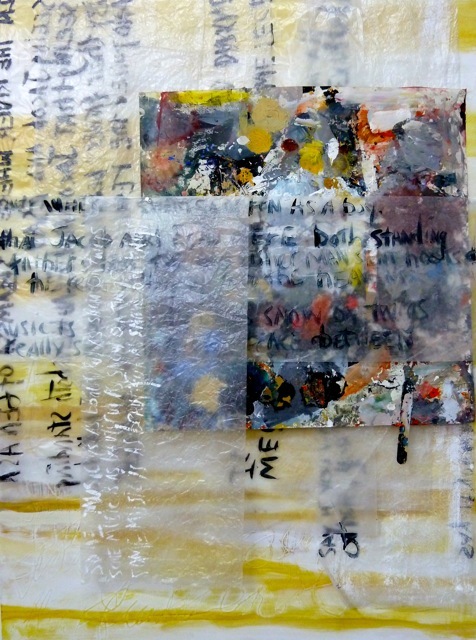 "Mixed Media Exhibition" will feature Marianne Lettieri, Joyce Leopardo and Joyce Savre, May 8 - June 30, 2012. 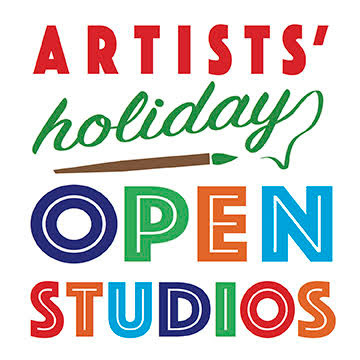 Hours are Monday through Friday, 9am -5pm. Joyce has 13 paintings here including San Francisco at Night II which recently received Honorable Mention at the "Female Gaze" art show sponsored by Peninsula Women's Art Council and Thank You For This Day which received First Place in Mixed Media at the 2012 Menlo Art League Exhibit juried by Claire Verbiest. 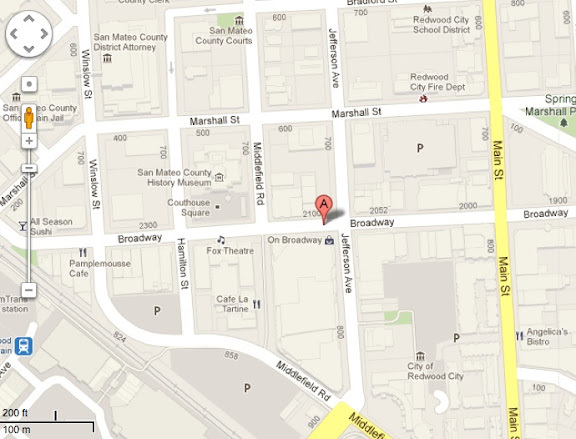 Caldwell Gallery is located in the Hall of Justice at 300 Bradford Street in Redwood City. 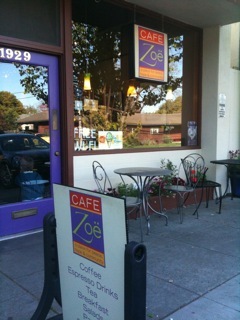 San Francisco at Night II 30X22"
Thank You For This Day IV 30X22"
I have just hung 13 paintings at Cafe Zoe in Menlo Park, a wonderful resting spot for coffees, tea, breakfast, lunch and always local art as well. 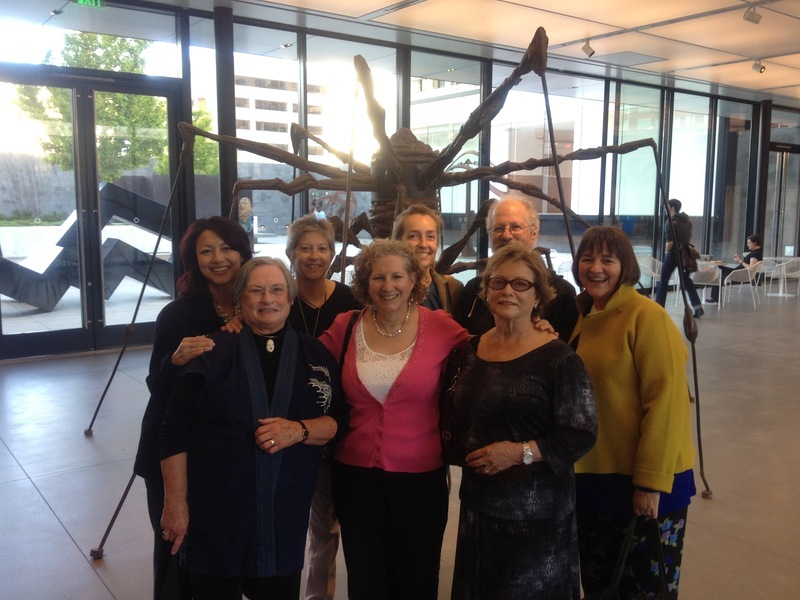 There is a wonderful community feel here: a warm ambiance, children and parents in and out... So please come by, invite a friend and enjoy this oasis. 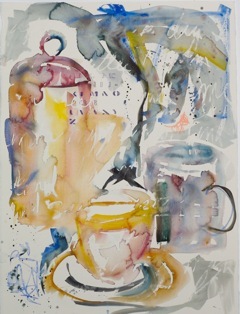 All of my paintings here have cups in them: my father had a coffee shop up in Moorhead, Minnesota for 40 years - a very small place, but one of fraternity where the farmers and local professors would sometimes be waiting for him in 10 below weather to open at 6 AM. The endless pot of Norwegian "egg coffee" (where a whole egg is mixed with ground coffee and then added to boiling water and simmered for 20 minutes) was also a staple in my home. So cups of coffee, memories around it and what the cup symbolizes have been very important in my life. Enjoy! 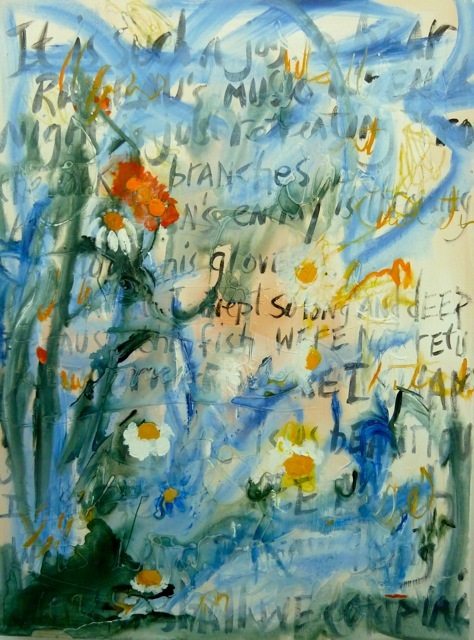 Kalani Engles and Joyce Savre will have small works on paper exhibited in 40 Watts: Illuminating Herstory at the Pacific Art League in Palo Alto from April 6th through 27th, 2012. 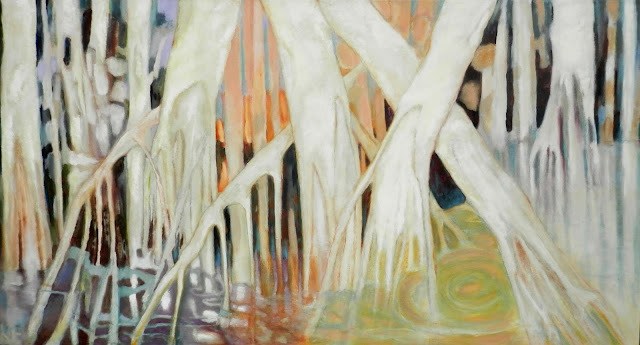 A reception for the artists will be held Friday, April 6th from 5:30 to 8:30 PM. Below is a photo of Kalani at work in her studio taken by Linden Street artist, Laura Diamondstone. 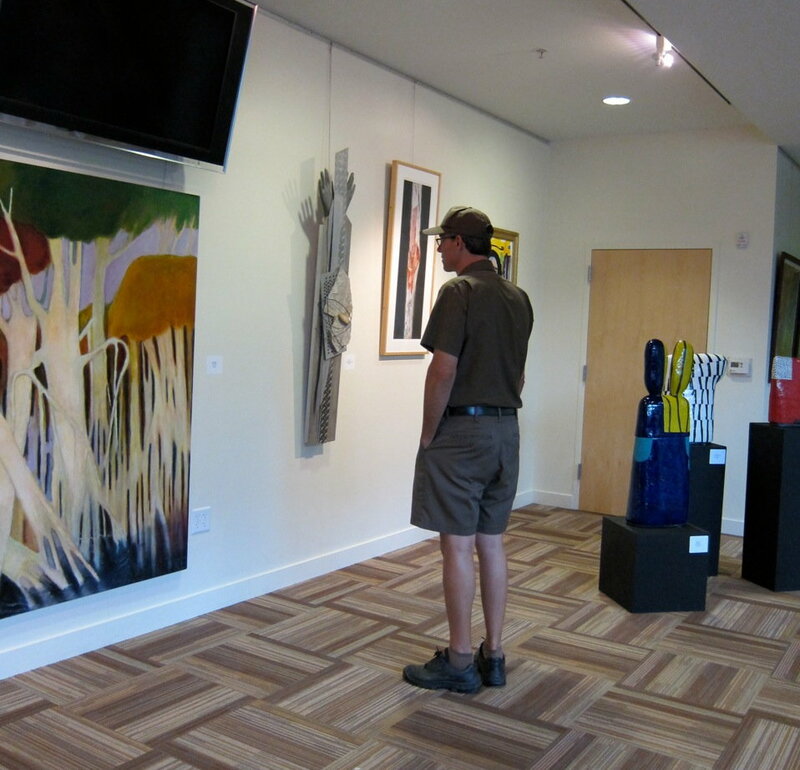 Lou Hess, the local UPS man, views Kalani Engles' painting, Salt Marsh 3 at the Kriewall-Haehl Gallery at the Woodside Priory in October. On October 6, 2011, a 14 foot high steel sculpture by Sean McGinn Smith (1959-2010) was installed at Vineyard 511 on Diamond Mountain in Calistoga. 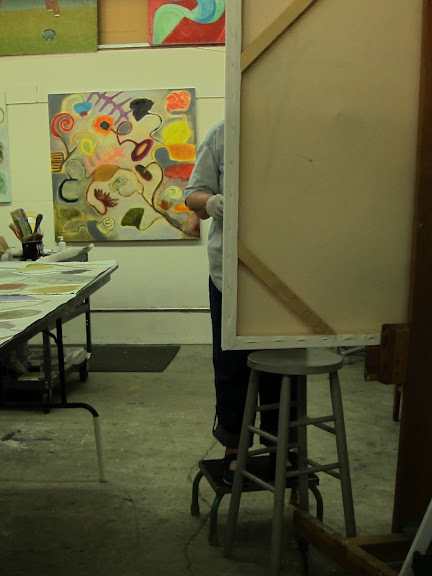 Sean was a painter and metalworker who worked at the Linden Street Warehouse in the studio of his mother, Kalani Engles. Raised in Woodside, California, Sean studied archeology at the University of Arizona and graduated from the Art Institute of San Francisco. Many of his works embody the form and image of cats, inspired by his beloved Abyssinian, Simba. One of his largest “Simba’s”, a 14 foot high steel sculpture, was purchased from his estate by Ed and Irene Ojdana, the owners of Vineyard 511. Below are photos of the sculpture being installed with the assistance of Sean’s brother, Tim Smith. Because the sculpture had been long exposed to elements, the original painted finish was showing signs of wear. The buyers decided to have it sandblasted, zinc coated and powder coated in its original colors to enable it to stand up to the elements indefinitely. They selected Precision Powder Coating in Belmont for the job and commissioned Linden Street Warehouse artist Laura Diamondstone, to restore the silver highlights on the decorative icons which cover the cat’s tail, body and double pedestal. The photos below show Alan Willms, proprietor of Precision Powder Coating, and Laura Diamondstone standing in front of sections of the sculpture prior to shipment. 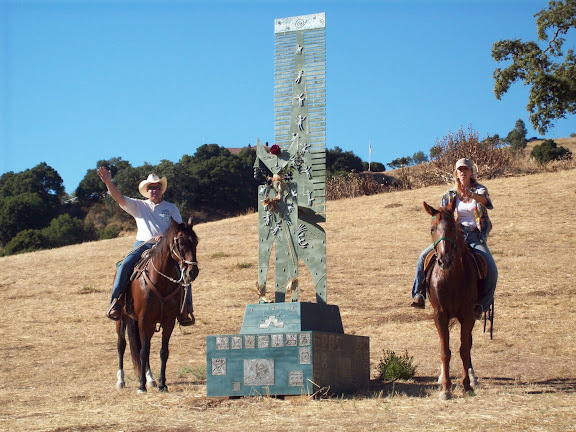 A photo of Sean’s brother, Tom, and sister, Laura, on horses beside the sculpture (prior to refinishing) demonstrate the scale of this work.